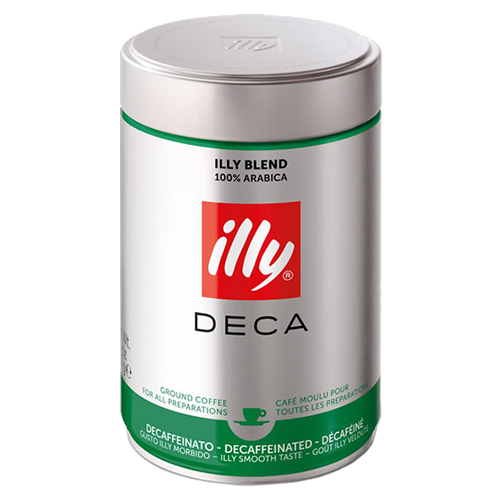 illy Espresso decaffeinato ground coffee is the same coffee as illy Espresso but without the caffeine. The caffeine is removed before roasting by a process that removes more than 95% of the caffeine from the fresh bean. The beans are then roasted and the result is illys praised coffee but caffeine free. Once in the cup it is characterized by a fine-grain coffee, reddish-brown crema and a varied, pleasantly spicy, soft and round taste. The espresso coffee has a long, round and elegant aftertaste.